Orange’s Ashley Au tracks a putt during the OHSAA Division I state tournament this weekend at the Ohio State University Gray Course. Liberty’s Trey Rath follows through on a tee shot during the Division I state tournament this weekend at the Ohio State University Scarlet Course. No matter how good you are, you can always get better. Just ask the Olentangy Orange girls golf team, which won its second straight state title with a two-day total of 602 at Friday and Saturday’s OHSAA Division I State Tournament at the Ohio State University Gray Course. The Pioneers finished tied for first last year, winning the crown via the fifth-man tiebreaker. This time around, though, tiebreakers weren’t even close to necessary. They shot a 305 on the first day and a state-record 297 (lowest single-day round in state tournament history) on the second. Their combined 602 — a mark 10 strokes better than runner-up Centerville’s 612 — was a state record as well. 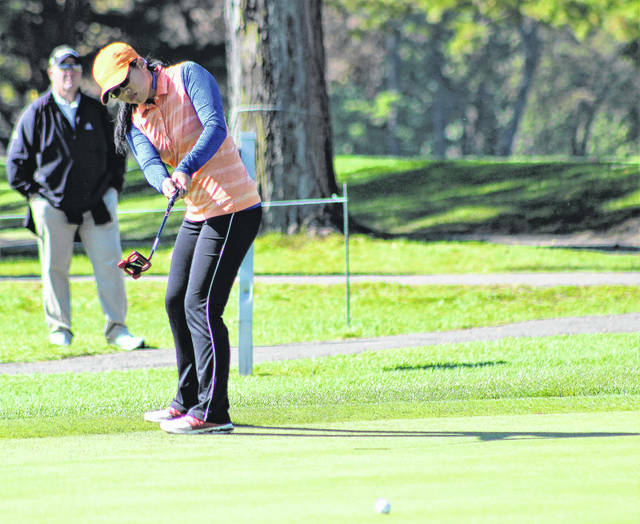 “All the girls did a good job of playing their games and not pushing for low scores,” Orange coach Cari DeAngelis said. The titles were both memorable in their own right, DeAngelis said. The first was special because it was the first in program history. The second, though, we record breaking. Ashley Au led the Pioneers with a two-day total of 145 (73 on the first day and 72 on the second. She was tied for sixth overall. Other contributors included Riley Dean (152), Natalia Sompolvorachai (152), Alyssa Kim (153) and Emily Fisher (166). On the boys’ side, Olentangy Liberty had a pretty special couple of days as well. 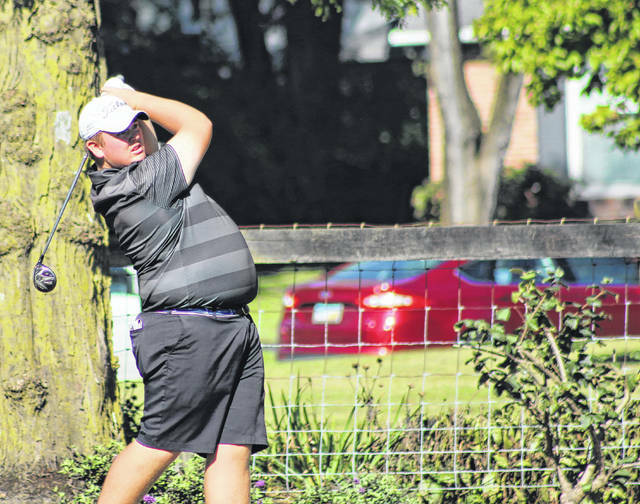 The Patriots, who were second behind Dublin Jerome after Friday’s opening round, used a consistent second round on the OSU Scarlet Course to maintain their runner-up spot. Dublin Jerome captured the title with a 607 while Liberty finished with a 616. Green smoothed out the top three with a 628. Trey Rath led the Patriots with a combined 147 — a mark good enough for second overall. Cole Corder (154), Grant Smeltzer (156), Jacob Hickman (160) and Josh Steyer (166) also chipped in. “We exceeded our goals for the weekend,” Liberty coach Ryan Snivley said. “This is an experience these guys will never forget.